One of the girls' favourite places that we visited in Canada was Vancouver Aquarium in Stanley Park. 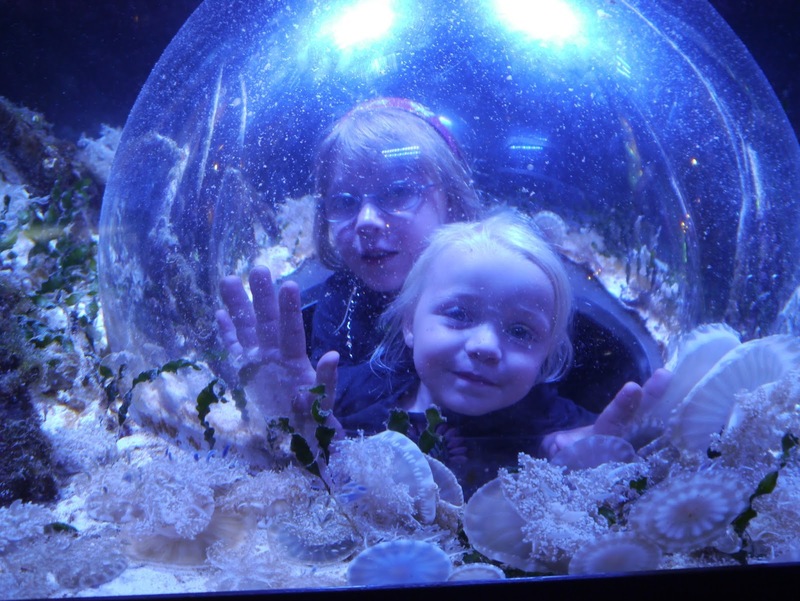 Both Ava and Lola are pretty obsessed with sea creatures so I knew that the aquarium would be a big hit with them. 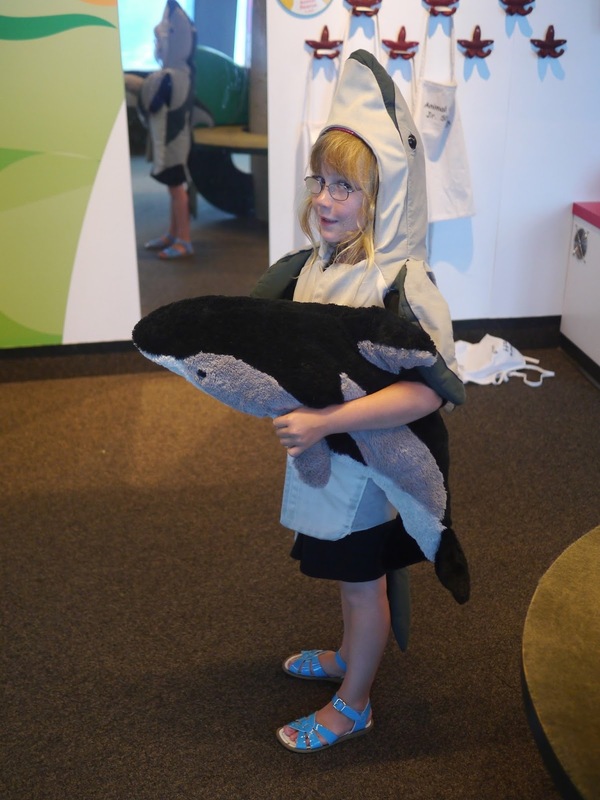 There were plenty of familiar sea creatures to see and a few that we hadn't seen before, including our new favourite, the beluga whale. Beluga. I love that word! First up for the day was the beluga whale show. 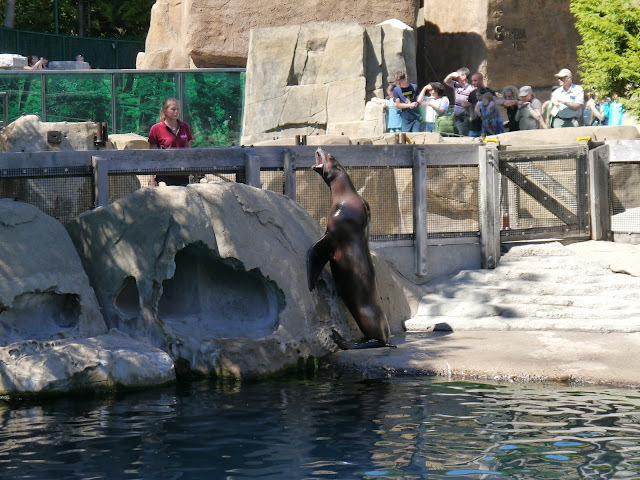 The keepers demonstrated how they interact with these majestic creatures on a regular basis, explained how these whales came to be at the aquarium and taught us a little about their environment, the perils they face in the wild and the research that is being done to learn more about them. 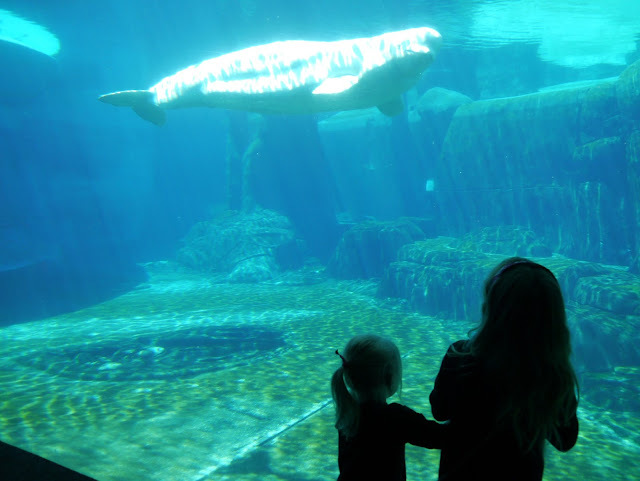 After watching the beluga whale show we headed downstairs to have a look at our new friends from underneath. On the way we stopped off to visit the river porpoises. 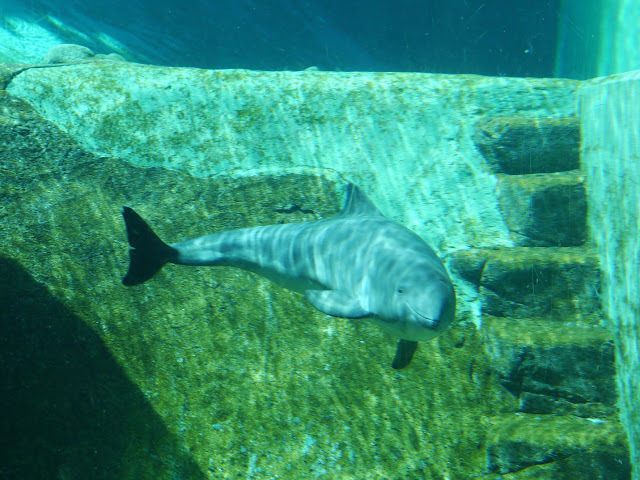 One particular river porpoise seemed very intrigued by all of the visitors watching through the glass, and swam past over and over coming very close to the glass as if it say hello. After watching the river porpoises for a bit we headed onto the beluga whales. I just can't get over how white they are. I had known that they were white but I had no idea just how completely bright white they really are. The brightness of their skin just seems unfathomable but I guess it does go with their natural, arctic environment. 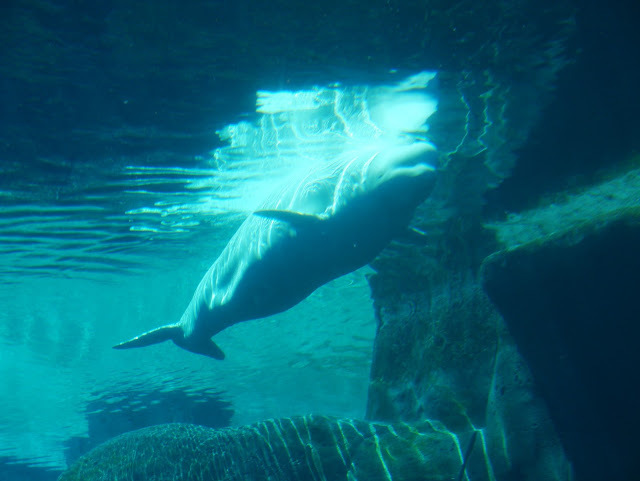 Being so bright white and with the sun shining down on them the beluga whales appeared to glow. We just couldn't get enough of these beautiful creatures and watched them for ages. Watching the beluga whales made us feel a little chilly so we headed back outside to the sunshine and a bite to eat. We stopped to watch the seals who, it seems, were also eager for a bite to eat! Hurry up and give me food! From the seals we headed over to the otters. These crazy otters were doing something I've never seen them doing before - tucking themselves into a ball and rolling over and over in one spot in the water! It was very amusing to watch! When they weren't rolling around like a hamster wheel the otters seemed to spend their time floating on their backs holding balls. 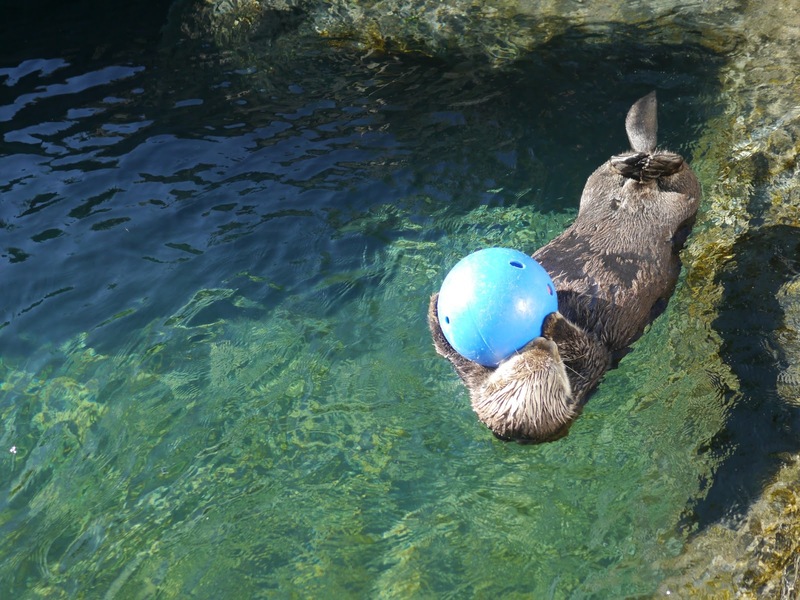 One particular otter seemed happy to just float around all day holding onto his blue ball with a look of complete happiness on his face. We wondered if he did that all day! 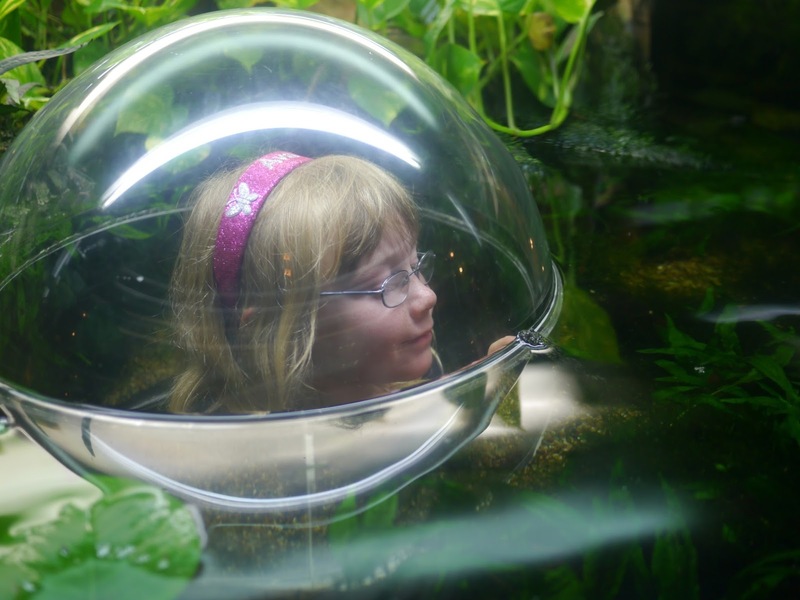 From the otters we ventured back inside to check out the jelly fish and frog displays plus the Pacific Canada Pavilion which features a two storey tank full of amazing sea life. 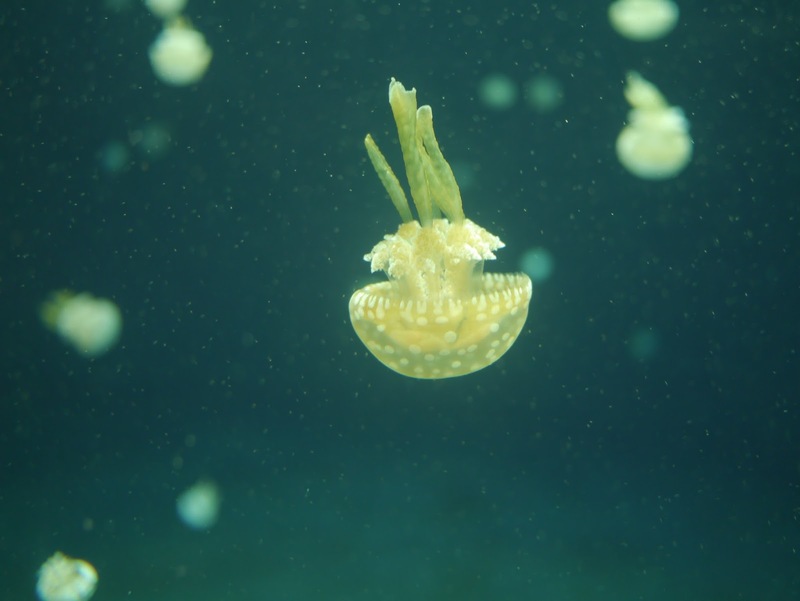 As always the jellyfish were absolutely stunning - in more ways than one! 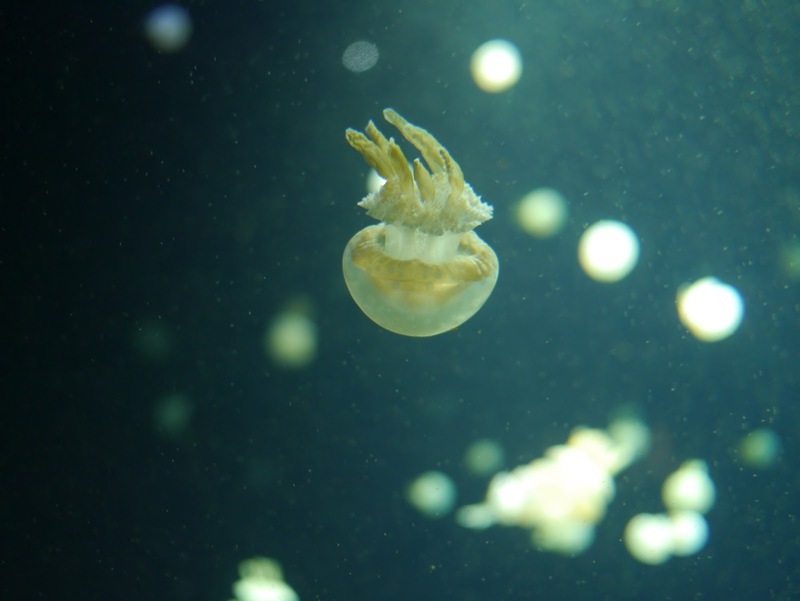 We watched the delicate little creatures bob about gracefully in their tanks and marvelled not only at their beauty but at the thought that something so fragile looking could also be so deadly. 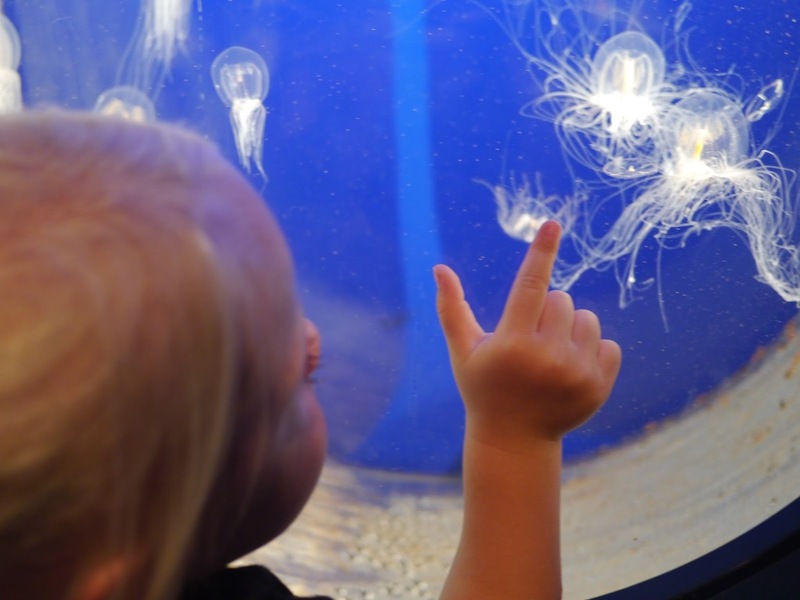 While their spaghetti mess of tendrils are beautiful to look at in the safety of the aquarium, I'm not sure I'd want to meet one up close in the ocean! 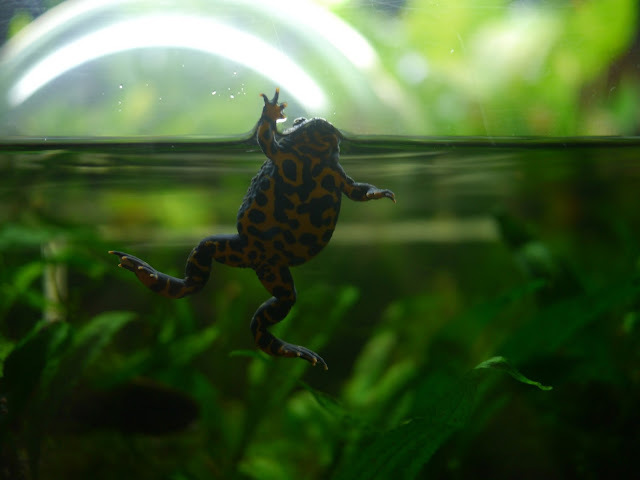 After breaking from the hypnotic spell of the jellyfish we checked out the frogs display. Ava's froggy friend came to say hello to me too! 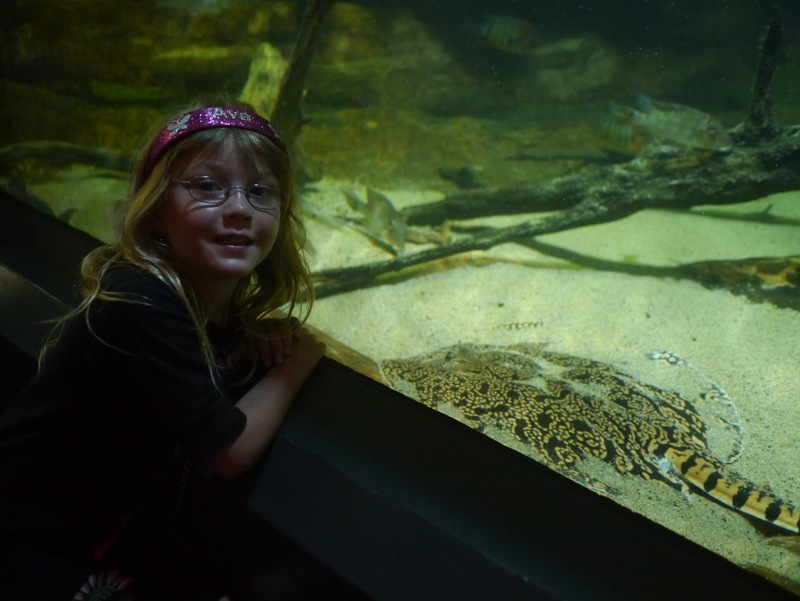 Another of Ava's favourite sea creatures is the ray. 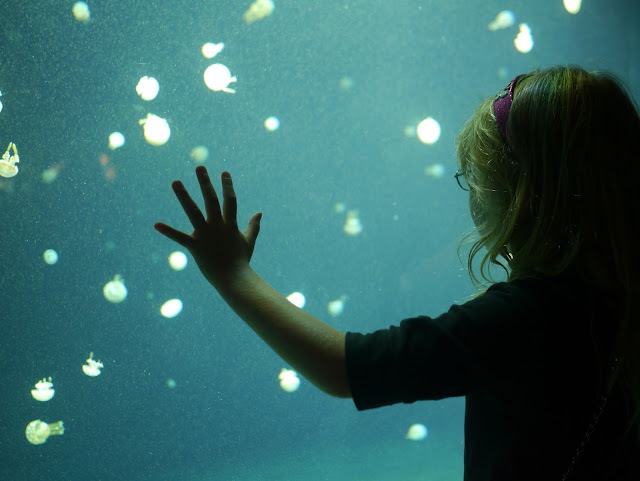 There were two in particular at the aquarium that Ava was quite taken with and she was of the opinion that the feeling was mutual! 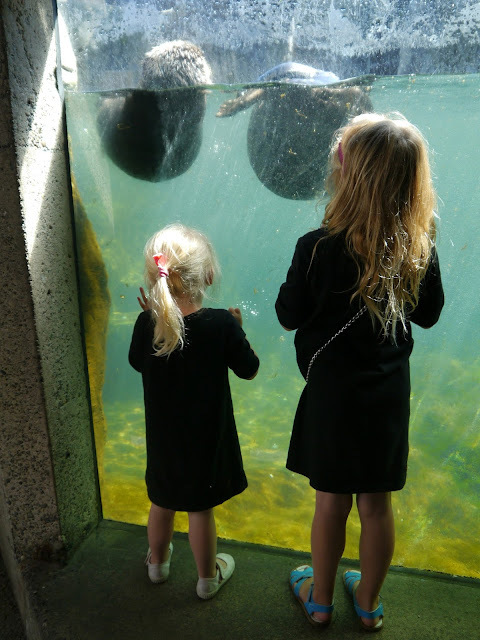 One in particular kept swimming right up against the glass of the Pacific Canada tank and then settling down right in front of Ava before resting a few minutes. 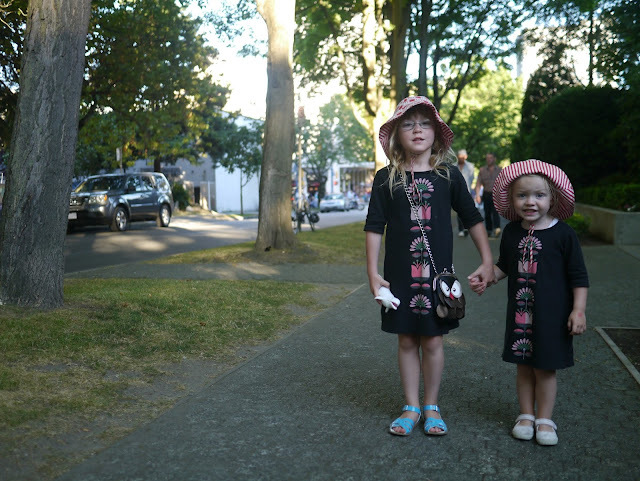 It did this several times and Ava was convinced that it wanted to be her friend! 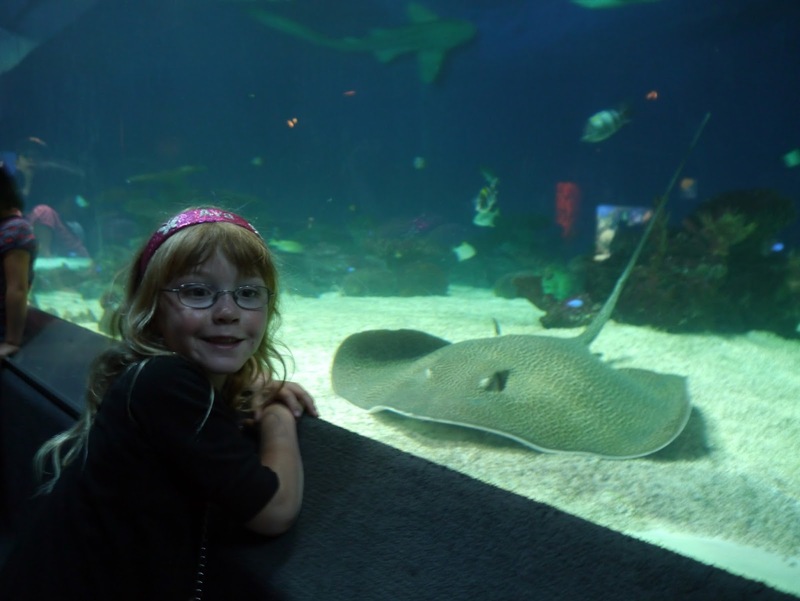 Ava was convinced that this particular ray really liked her! Apart from the beluga whale show, the other big drawcard show at the aquarium features everyone's favourite sea dwelling mammals. That's right, dolphins. 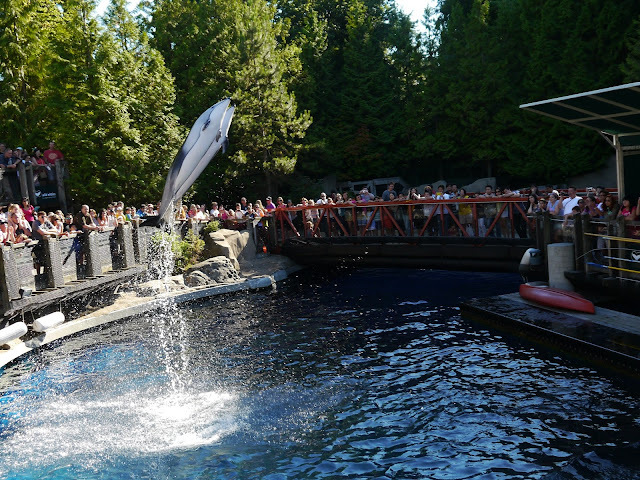 The dolphins on show at Vancouver Aquarium are Pacific white-sided dolphins. 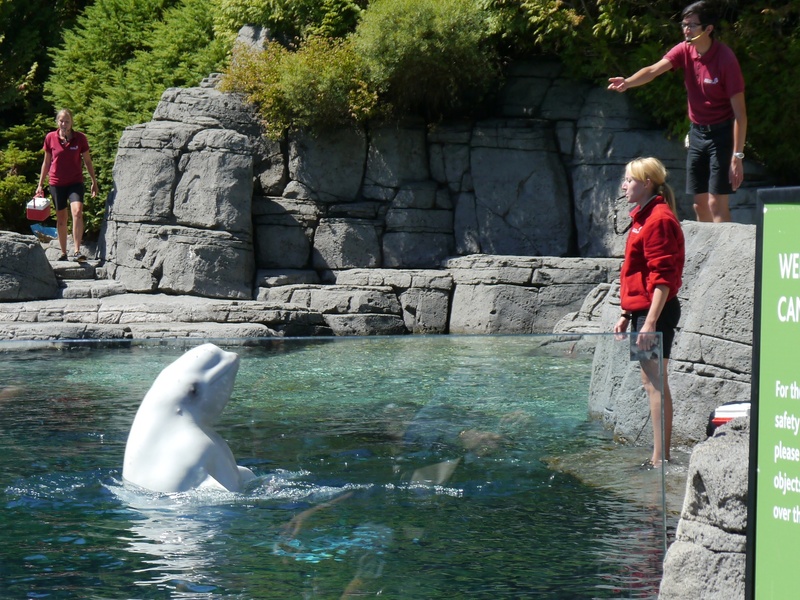 Just like the beluga whale show the keepers demonstrated how they interact with the dolphins on a regular basis for medical checkups, measuring and of course, feeding. Unlike the beluga whale show there were some pretty spectacular jumps through the air involved. 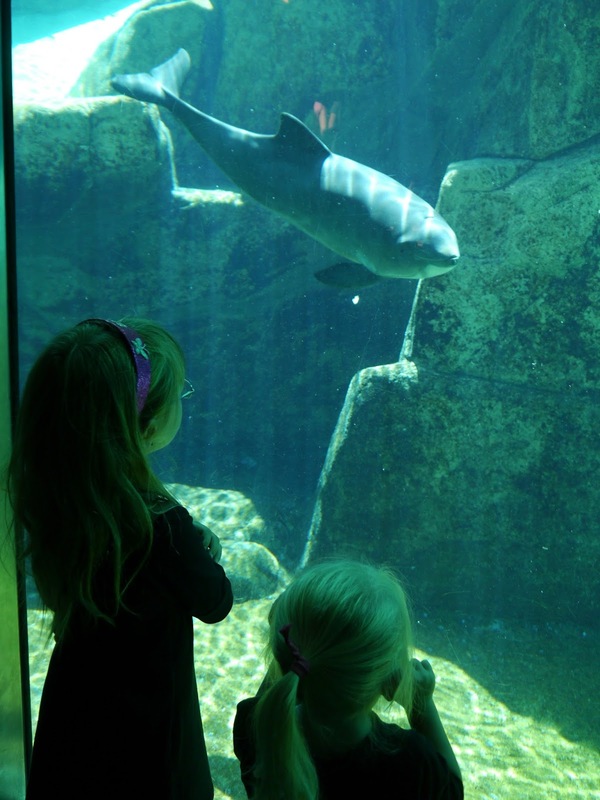 The girls were in awe of the dolphins' tricks. I was in awe of their speed. 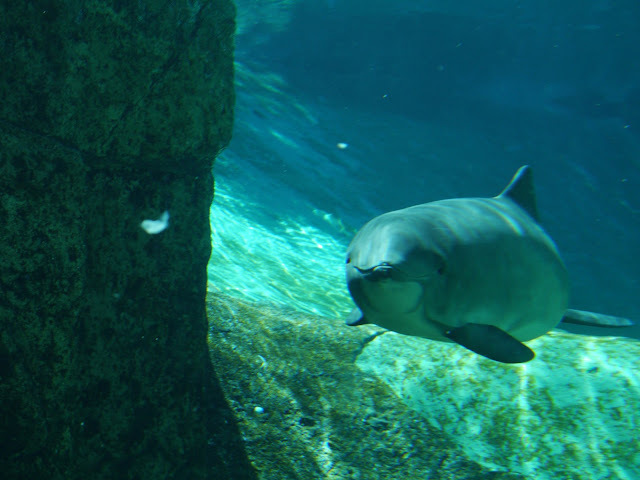 Pacific white-sided dolphins have been clocked at swimming at almost 30 miles per hour! 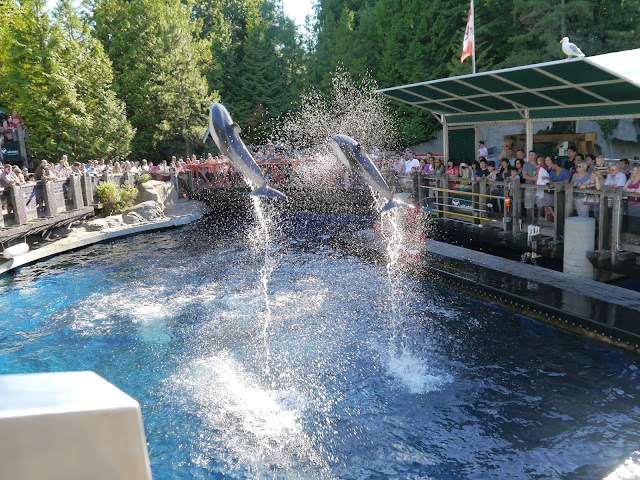 A couple of times during the show the dolphins demonstrated their speed and they were just a blur moving at high speed around the tank. Back inside after the dolphin show we headed to Clownfish Cove, a children's play area where Ava decided to act out her own little dolphin show! The day flew by quickly and before we knew it it was time to leave. On the way out we walked back past the otters and sure enough, the lazy otter was still floating around holding the blue ball! P.S. To top off such a great day we were treated to some of the most spectacular fireworks we've ever seen as part of the annual Celebration of Light festival. You can see my photos here.